1999 BMW r1100r cafe/touring for sale or trade for ds - DAMN Riders - No rules, Just ride! 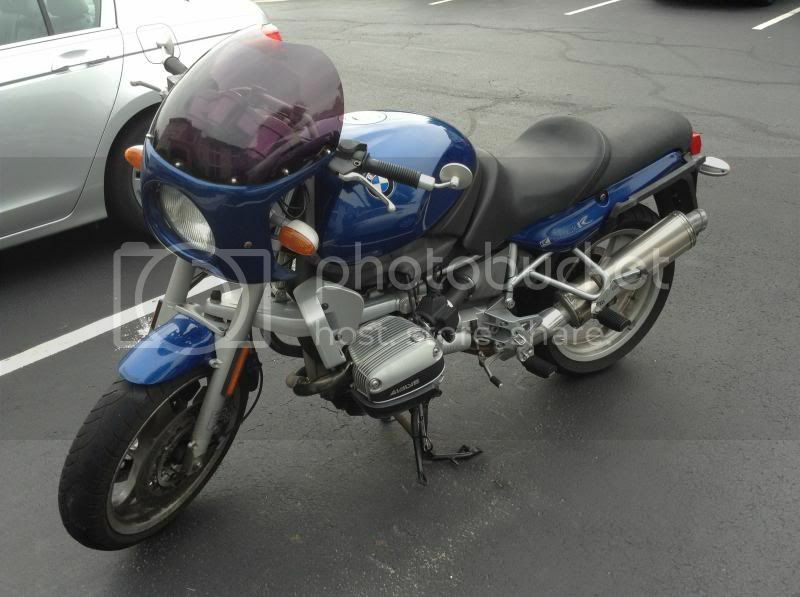 I'm planning on selling my 1999 BMW r1100r to buy a dual sport. It's very reliable and should pass inspection as it is. I'm open to trades as long as I don't need to add money to make the deal. I rode it to Laconia NH last year (700 miles in a day) with no problems and would not hesitate to do it again. Last edited by cwbashaw on Thu Jun 20, 2013 8:36 am, edited 1 time in total. Nice bike. I'm not in the market, but you forgot to include the price. I like this...have been looking for a something to sport ride on vs the C14. I have a nice 07 DRZ400S that might work for ya. pm me your email and I will send you some pictures. That sounds exactly like what I'm looking for. I can email you more pics when I get home as well. Whats the total mileage on this bike? Not really knowing much about this bike, let me do some research. As I stated I want something more sporty to ride than my C14...not sure this is actually the bike to do that with. Ovo wrote: Whats the total mileage on this bike? It has about 34K miles people regularly get well over 100k miles out of them. It uses the same frame and engine as the 1100gs. A few people on adv have even converted them to adventure bikes without much work... here's a good thread on adv that talks about them. FWW, I had a R1150R (just newer version of this bike) and I can say it was good fun. The weight is down low and lets it change direction with ease. I enjoyed most how it would pull so smooth, no bog or hit. Sold it to get the RT (that D-Grunt has now) for better 2 up bike to make the better half happy. IMHO, the R1100R has better "classic" lines than my R1150R had. Ovo, you would need go sit on it. Some taller guys have issue with the spacing where you tuck your legs into the tank area. I put about 20k+ on one I had for just under a year about 10 years ago. I wouldn't mind letting you take it for a day or two to take a good test ride if that's something that would interest you. If it works for you great, if not then there would be no obligation or hard feelings. I love the bike, but I miss playing in the dirt. I could keep it and get a 2nd bike I would, but I'm buying a new house and we have a new baby so I have to pick one or the other for now.